This recipe could not get any easier and it is SO tasty! Cut the head of cauliflower into even sized chunks Mix Veganegg with soy milk and whisk – it should be thinner than the normal ‘egg’ recipe Pour the packets of breadcrumbs into a bowl Add cauliflower chunks to Veganegg mixture and then coat with breadcrumbs Add pieces to your air fryer basket evenly Air fry at 400°F for 10 minutes (If you do not have an air fryer you can bake them in the oven at 425°F) timing may need adjusting. Remove wings and toss in Buffalo or BBQ sauce then fry for another 10 minutes watching closely – bake until browned Served with a side of JUST ranch, BBQ or dressing of your choice. My husband made the buffalo sauce, I’ll find the recipe for you and post it. These look and sound absolutely delicious! I need them! These look absolutely delicious! Cannot wait to make them! 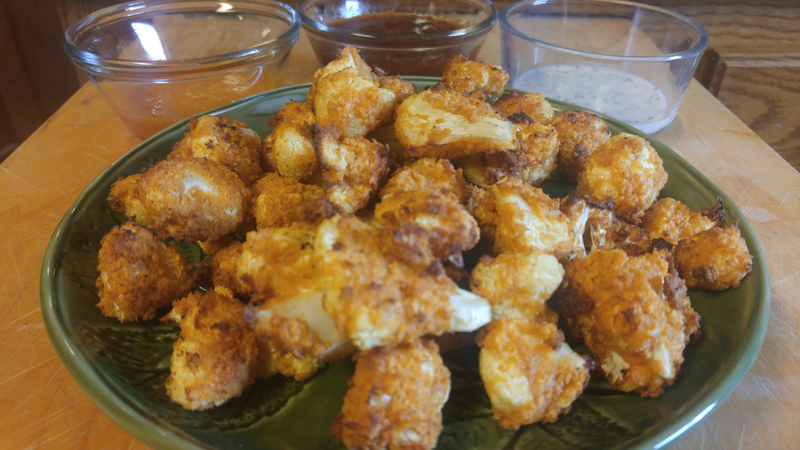 I am craving cauliflower wings now! One of the best homemade vegan dishes everrrr!